Wales great Gerald Davies made his international debut in December 1966 against Australia in Cardiff, playing in the centre during his early career. He was switched to the wing by Welsh coach Clive Rowlands during their 1969 tour of Australia and New Zealand, and his famous side-step and rapid acceleration led to him dominating the Wales wing for the remainder of his career. Davies was a British and Irish Lion in 1968 and 1971, one of a raft of Welsh players alongside Barry John, Gareth Edwards and JPR Williams to enter into the folklore of both the Lions and Wales. He is perhaps best remembered for his last-gasp score against Scotland in the 1971 Five Nations, crossing in the corner before flanker John Taylor added the extras with the "greatest conversion since St.Paul" for a 19-17 Wales win. 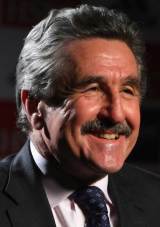 Following his retirement from playing, Davies became a respected rugby correspondent for The Times and holds honorary fellowships from the University of Wales Lampeter, Aberystwyth and Cardiff. Davies also served as the team manager for the 2009 Lions tour to South Africa.